VGVJ Hygiene Solutions Private Limited established 2015 is considered to be the one the prominent wholesaler, retailer, trader and supplier of quality products. The ownership type of the company is Private Limited Company and we have situated our operational head at Chennai, Tamil Nadu (India). 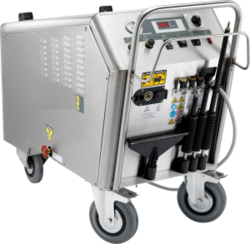 We are affianced in offering wide gamut of Steam Generator, Ride On Floor Scrubber Drier, Chemical Sprayer, Foam Jet Sprayer, Steam Cleaning Machine, Ultra Pressure Dry Steamer, Carpet Cleaner Active and many more. In order to produce qualtiy products in the industry, we have hired a team of dedicated and devoted staff that performs their function in a fruitful manner. Our team of personnel uses latest technologies and equipments in order to have excellent qualtiy production in the industry. The material is procured from the well-known merchants of the market. Our vendors have created a dignified position in the market. Further, our infrastructure facility is maintained by our experts in a systematic manner. The warehouse unit is highly spacious where we store bulk of finished products and material for future use. Moreover, the qualtiy of the products is sternly monitored under various parameters by our qualtiy analysts. Thus, by providing optimum qualtiy products in this competitive market, we have created a market for ourselves and have become one of the preferred choices of the customers.